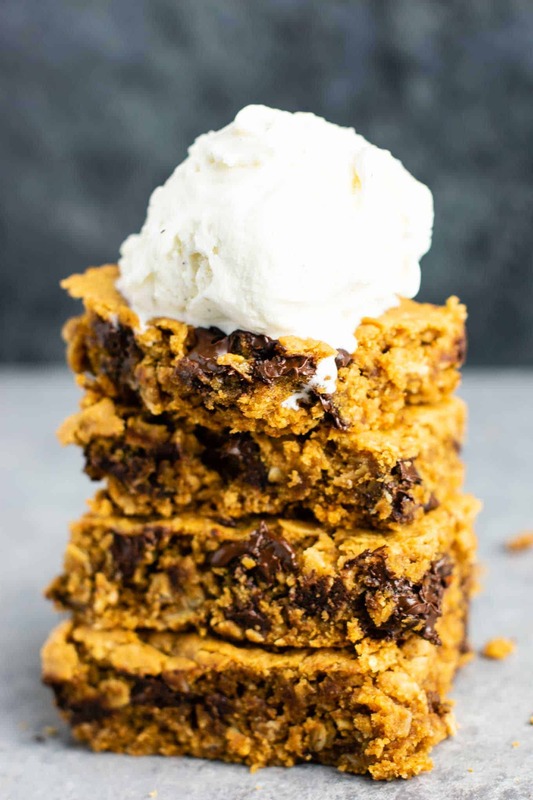 Gluten free cookie bars that are secretly healthy but taste incredibly decadent. You have to try this gluten free dairy free dessert! 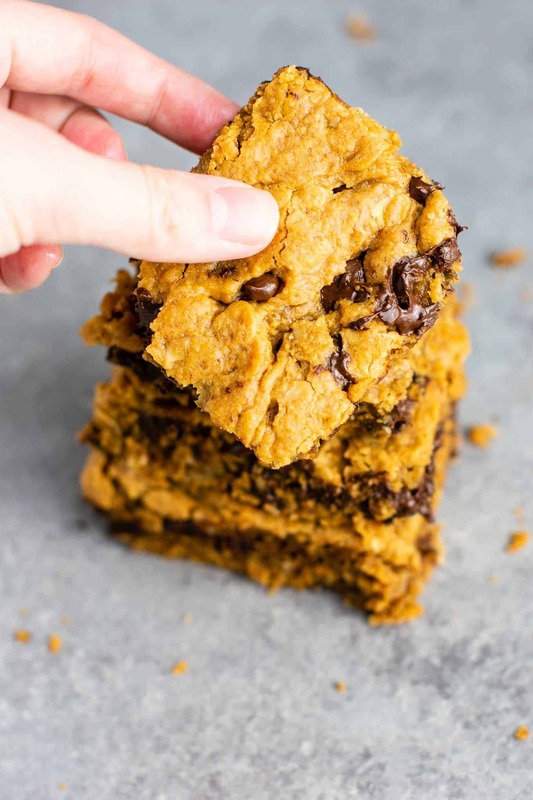 These gluten free cookie bars are just the best. A chocolate chip cookie taste with a brownie texture…what could be better? 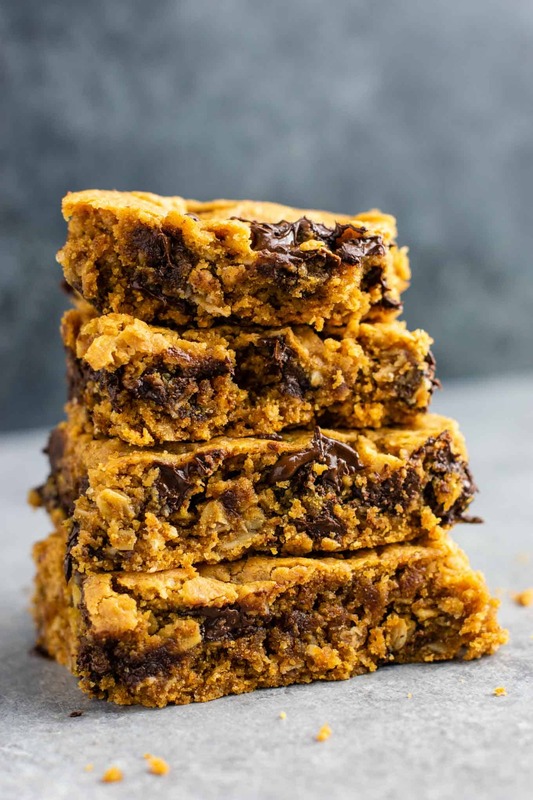 Cookie bars are one of my favorite recipes… is it a snack? a dessert? Who cares – they are delicious! 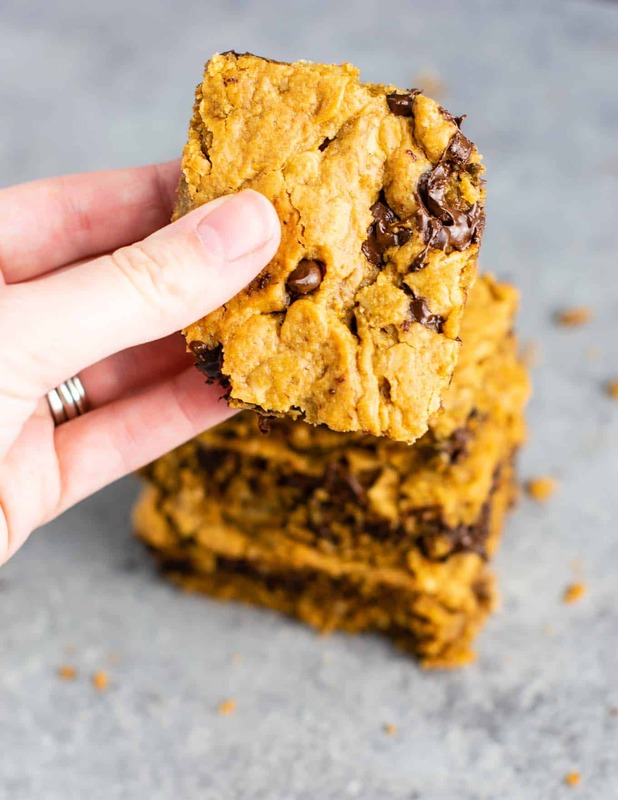 These gluten free cookie bars are incredibly moist, full of flavor, and healthy enough to eat for a snack! Beat peanut butter, melted coconut oil, brown sugar, honey, and vanilla in a large bowl until well combined. Add eggs to the batter and beat well. Grease a 13 X 9 casserole dish and pour in the batter. Use a spatula to flatten out the bars evenly into the pan. Bake at 350 degrees for 18-20 minutes, or until a toothpick inserted comes out clean. Serve warm with vanilla ice cream or just as a snack! These are protein packed and full of feel good ingredients. While I personally don’t have a gluten intolerance, I enjoy creating recipes that my gluten-free readers can enjoy. I’ve also noticed that gluten-free desserts tend to make me feel better and are lighter in general. I ate these bars both cold out of the fridge for a snack, and also warmed up with a scoop of vanilla ice cream – SO SO good. Ridiculously good. So good that it tasted like a fancy dessert you might order at your favorite restaurant! I feel like a lot of gluten free recipes tend to get a bad rap. I have definitely tasted some bland or texturally-challenged recipes. It can be difficult to get the texture right when baking without gluten. I’ve sort of made it my mission to make a good collection of gluten free recipes for everyone to enjoy. I even wrote a roundup of 25 gluten free dairy free desserts that I have personally made and loved! 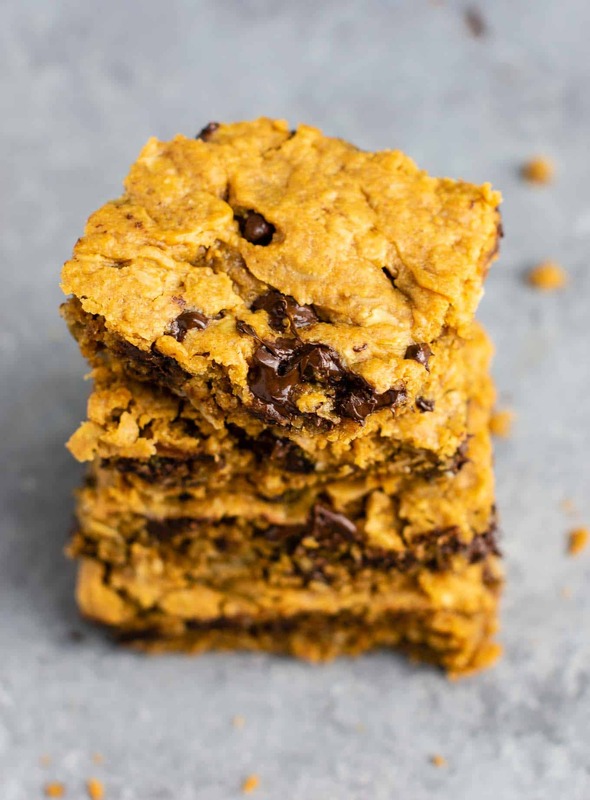 These bars are made with oat flour, coconut flour, and rolled oats. Peanut butter holds it all together and adds protein too. I use all natural peanut butter in this recipe, and it’s the only kind I buy. If you are looking to buy healthy peanut butter, just be sure the ingredient label only has two ingredients: peanuts and salt. Surprisingly easy, and incredibly decadent. My son was begging for these and I didn’t even feel bad letting him eat a whole bar. 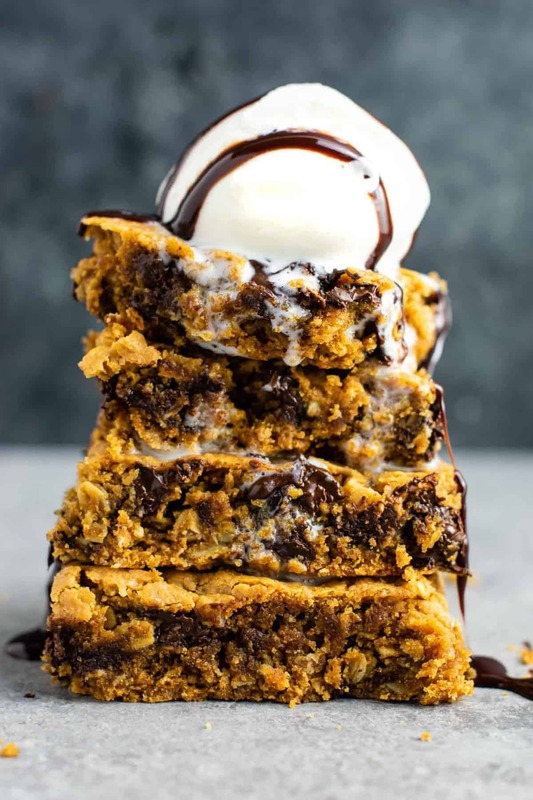 They are really so healthy compared to most cookie bar recipes. Give these a try, I promise you won’t be disappointed! Need any more convincing? Don’t walk but RUN to make these. Even my picky toddler that eats practically nothing laughed out loud and danced when he tasted one of these. Hungry for more gluten free desserts? Here are some reader favorite recipes! or read my roundup of 25 gluten free dairy free desserts! 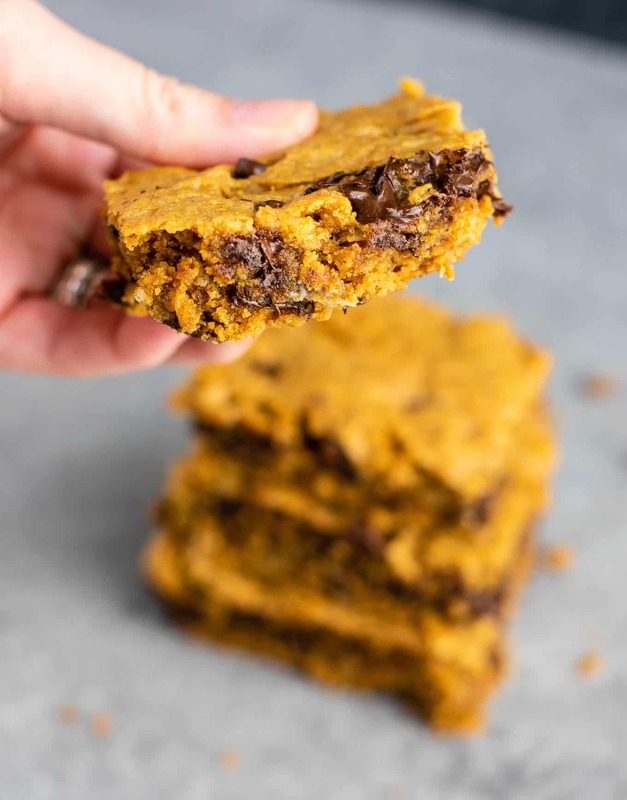 Ultra decadent and secretly healthy, these gluten free cookie bars do not disappoint! Add dry ingredients to wet and mix together. These are so good I want to eat the whole pan! Do you know the nutrition facts? Do they need to be refrigerated? So glad you enjoyed the recipe! I don’t provide nutritional info (yet! ), but you can calculate it online. I do refrigerate mine for longer keeping, but they will last a few days at room temperature! These sound amazing!!! can’t wait to try them. I love peanut butter and chocolate!